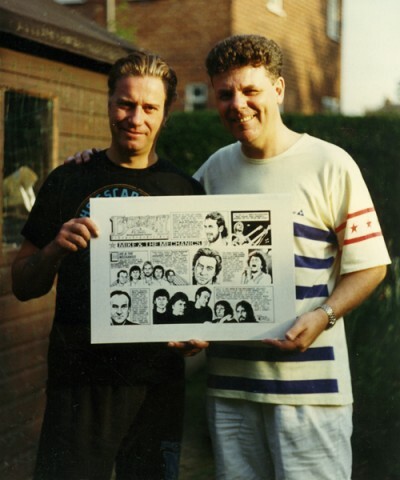 This is a 1989 photo of me (Steve McGarry) presenting Paul Young with original artwork from my syndicated US cartoon strip "Biographic." It's taken in the back garden of his mum's house in Benchill, Wythenshawe. Paul and I had grown up a few hundred yards apart on Hollyhedge Road, and my mum had known his mum, Blanche, for donkey's years. Paul was 6 years older than me, and when he first got a bit of glory with The Toggery Five he was a local superstar. Later on, he formed Sad Cafe and we were still quite friendly, and hung out every once in a while. By the time this was taken, I'd featured Paul in my daily cartoon strip "The Diary of Rock & Pop," which ran in The Daily Star for a year in 1986/87. I'd just started a new feature in America called "Biographic" and had featured Paul's new band, Mike + The Mechanics. I was just about to relocate my family to California and Paul wanted the original artwork, so I met him round at his mum's house. It ended up that he took the Diary of Rock & Pop original, but he decided that Mike Rutherford would get a bigger kick out of the Mechanics original. We decided that I'd ship the art out to the US with all my other stuff, and meet up in California, as Mike + the Mechanics were about to tour. A few weeks later, The Mechanics played The Pacific Ampitheater in Costa Mesa, California and I met up with the band backstage and gave Mike the original. In return, I have had all the band sign a print of the art ... which I'll also upload when I find the bugger.